The 2010 World Cup has ended in South Africa. What's left behind are a number of physical and cultural legacies that will be both landmark developments and potential economic hazards. There are no vuvuzelas. The plastic horns had been blaring at random throughout the city of Johannesburg for the entire month of the 2010 World Cup, which has just finished here in South Africa. They were even blaring the month before the Cup started -- in the middle of the morning, out of car windows on the freeway, inside the city's endless shopping malls. But now that it's over, the loud honk that had become a part of the city's background static has faded out. Gone too are the hordes of soccer fans from all over the world, as well as the global media that was almost impossible to miss in the event's host cities. Johannesburg, being the country's main airport hub, was especially crowded with foreigners, giving the city a strange dichotomy of locals and outsiders -- a line sometimes hard to decipher in this melting pot city, even for the country's born-and-bred. 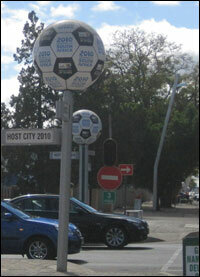 Host to 15 of the tournament's 64 matches (the most of any host city since the World Cup's first iteration in Montevideo, Uruguay in 1930), Johannesburg is the perfect specimen to examine as the Cup and its related excitement floats away like so many outbound flights at OR Tambo International Airport. Yes, the World Cup is over, but the impact of the Cup will continue to be felt here in Johannesburg, and indeed throughout the rest of the country. South Africa's World Cup brought the country benefits and burdens. The ten stadia used for the month-long tournament are both. "Our stadiums are architectural masterpieces," said Danny Jordaan, head of the event's Local Organizing Committee. He's not wrong. The ten stadia either renovated or built brand new for the Cup are impressive, especially compared to those used in past World Cups. With bold, flashy designs, South Africa's World Cup stadia make a statement -- and a new set of landmarks for the country and its nine host cities. Built with $2.2 billion of government funds, five stadia were built from scratch specifically for the World Cup, while five others underwent varying degrees of renovation. A few of the highlightsinclude the brand new venues in Durban, Port Elizabeth and Cape Town, each with iconic designs from the German firm GMP Architekten. Soccer City in Johannesburg, South Africa. One of the ten stadia either built or renovated for the 2010 FIFA World Cup. 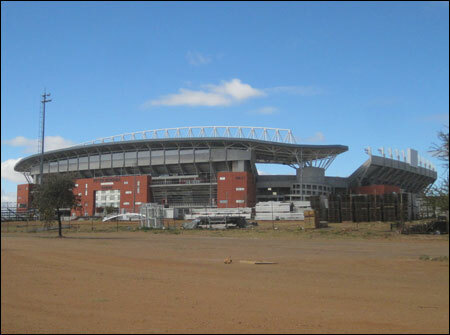 The most notable stadium is Soccer City in Johannesburg, near the city's southern township of Soweto. Probably one of the most striking images from the Cup, the $440 million project was a 90% demolition of the original 1987 structure, redesigned by South Africa-based Boogertman + Partners in conjunction with U.S.-based Populous. Inspired by the calabash, a traditional African cooking gourd, the stadium has given the city a facility that honors an African heritage that had for so long been brushed aside or outright ignored. 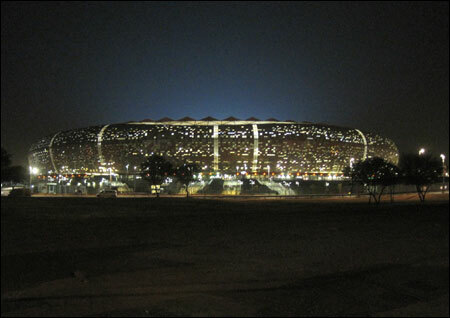 Soccer City is South Africa's national soccer stadium, meaning it will host the national team's international matches. Though no local team has plans to use the stadium as its home turf (nor the crowds to consistently load up the 94,700-seater), representatives from the four Premier Soccer League teams in and around Johannesburg have committed to hosting at least 12 matches at the stadium per year. Talks are also underway with officials from the South African Rugby Union. Despite being the sport of the white minority in South Africa, rugby is by far the nation's most popular sport, and big crowds could be expected for almost any match at Soccer City. Soccer, on the other hand, has only a few teams nationwide popular enough to draw big crowds. But the official vision for the future of Soccer City goes beyond the pitch. "Soccer City cannot only be used as a sporting facility," said Sibongile Mazibuko, executive director of the City of Johannesburg's 2010 office. She says the stadium's broadcasting facilities will be an asset to radio and TV companies, while its private suites and 200-seat auditorium could see future use hosting conferences and events. In short, it's going to be used, here and there, and maybe a little more. Not exactly the most solid schedule of events, but Mazibuko and other city officials are confident they'll get their money's worth -- mainly because Soccer City fills a void. "South Africa has not had a venue to actually house 100,000 spectators at one go, and Soccer City provides that for national events -- for the state of the nation, the inauguration of heads of state, the bidding farewell of heroes of South Africa," she said. "It is a facility that will be maximally utilized." 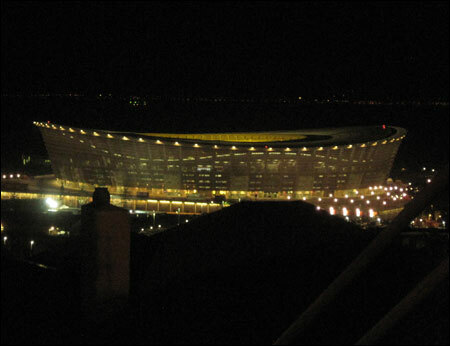 Cape Town's Green Point Stadium, newly built for the 2010 FIFA World Cup. At a cost of $773 million, this is the most expensive stadium built for the tournament. The Green Point Stadium in Cape Town also is without a permanent home team, but officials have contracted an events management firm to bring in concerts, sporting events and conferences. The situation is a bit more precarious in Port Elizabeth, where both the local soccer and rugby teams failed to qualify for the upper level of their respective leagues. Neither is likely to want nor be able to fill the city's new $270 million stadium. And in the smaller cities of Polokwane and Nelspruit, the return on investment is even more uncertain. Though both cities have a long tradition of soccer playing, neither has a high-caliber club. Both stadia are expected to be used for soccer and rugby matches, though only sporadically. The brand new Peter Mokaba Stadium in Polokwane, one of the smaller host cities with roughly 500,000 people. There are concerns about how the city will contend with the costs of building and maintaining this new stadium. "It's not about whether they'll be used, it's whether they will be financially viable in terms of maintenance costs," said Phillip Harrison, a member of the South African government's National Planning Commission. "I think there is a legitimate concern about whether they'll bring in sufficient income given the fact that these areas are already financially stretched." Officials in South Africa understand the potential risks they've brought upon themselves. They've seen abandoned Olympic venues blight Athens. They know that even Beijing has had trouble luring events to its infamous Bird's Nest stadium. But South Africa remains hopeful. For the host cities, these stadia are seen as springboards for development. But there's also the distinct danger that they could become unsustainable money pits. It's too soon to say which is the case today. But it will probably take only a few years to see if the cities are able to jump on those opportunities, or if they'll fall victim to their grandiose but potentially short-sighted World Cup investments. 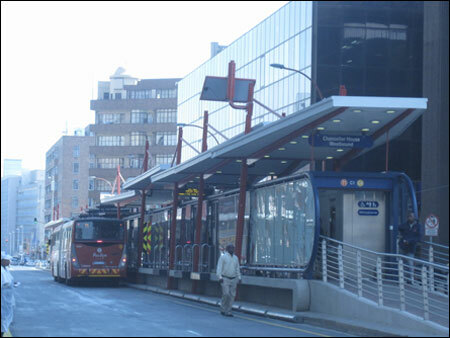 The Rea Vaya bus rapid transit system in downtown Johannesburg. Beyond the field, the city has benefited from the quick development of a new bus rapid transit system, spurred to creation by the World Cup. Known as the Rea Vaya, the system opened its Phase 1A in time for the World Cup, and was reportedly instrumental in transporting hundreds of thousands of spectators to matches at the city's two stadia. At build-out, the system will contain close to 100 stations covering more than 200 miles, helping to transform a culture traditionally tethered to the automobile and the formalized informal network of minibus taxis that zip around the city. Also coming on line in time for the Cup is the new regional rail system, Gautrain. Though only the first phase has begun operations, the system's already created its most important connection: between the airport and the posh northern suburb of Sandton, the city's second CBD. These, in a concrete sense, are positive legacies of the World Cup, though some cynics in the city have argued that these projects would have been built eventually even if the World Cup never happened. But for a country with an estimated 6 million people still living in tin shacks with no water or electrical hookups, "eventually" is a term often uttered but infrequently realized. Aside from these physical projects, the most important legacy of the World Cup is likely to be a social legacy. The Cup has given South Africans a new source of pride. Pulling in the third most spectators of any World Cup behind Germany in 2006 and the U.S. in 1994, South Africa's perception as a successful World Cup host has been legitimized. For a nation that has struggled with the demons of its horrific past, the World Cup marks a major positive point in the young democracy's history, second only to the historic end of apartheid and election of Nelson Mandela as its president in 1994. The second most important social legacy is the widespread notion that South Africa can do it. They've showed the highly skeptical world that they can successfully host one of the biggest sporting and media events in the world. As a result, South African eyes are already looking at a possible bid for the 2020 Summer Olympics. But with a myriad of challenges and problems facing the country, it's likely that much of this positive momentum will be directed outside the playing field. All there is for South Africans to do now that they have a World Cup under their belt is to ask what they can accomplish next -- and truly believe that they can. Nate Berg is a contributing editor at Planetizen and editor of World Cup Planning.